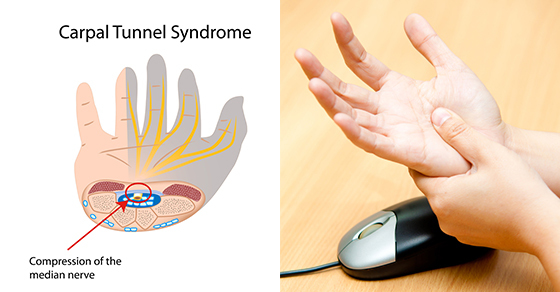 Carpal tunnel syndrome is compression of the median nerve as it passes into the hand. The median nerve is located on the palm side of the hand (also called the carpal tunnel). It provides sensation (ability to feel) to your thumb, index finger, long finger, and part of the ring finger. Compression of the nerve produces numbness, tingling and, eventually, hand weakness. Proper Physiotherapy treatment can relieve the tingling and numbness and restore wrist and hand function. • Proper posture for work and home while reading, working on the computer, etc. Overall, Carpal Tunnel Syndrome is a very uncomfortable condition. It can interrupt your life and your sleep. Getting the proper Physiotherapy Treatment Program is very helpful! PhysioNow has fully trained Registered Physiotherapists standing ready to help you Now! Please call today to get started on relieving your pain!